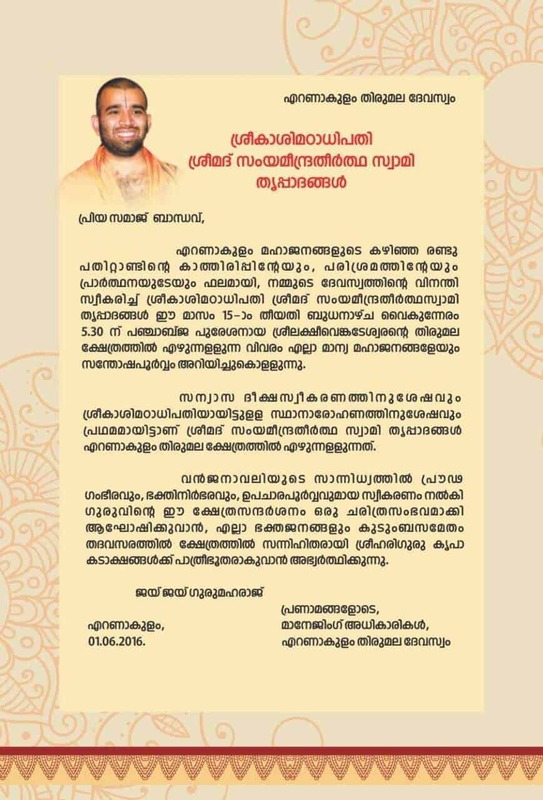 Pratishtapana of the Sacred Padhukas of Pratahsmaraneeya Paramapoojya Sadguru Shrimath Sudhindra Thirtha Mahaswamiji will be done by H.H Shrimath Samyamindra Thirtha Swamiji (Mathadhipati of Shree Kashi Math Samsthan) during the first ever visit to Ernakulam Tirumala Devaswom on 15th June 2016. 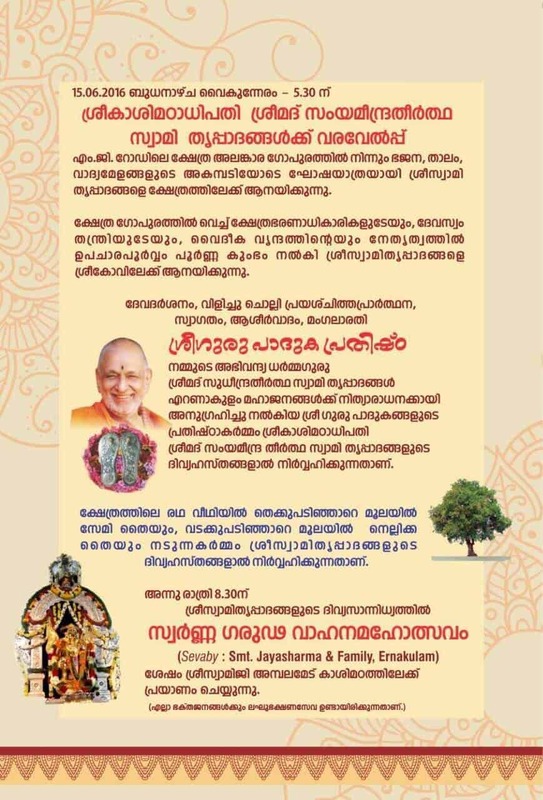 It must be noted that Ernakulam is the holy place where H.H Shrimath Sudhindra Thirtha Swamiji incarnated. 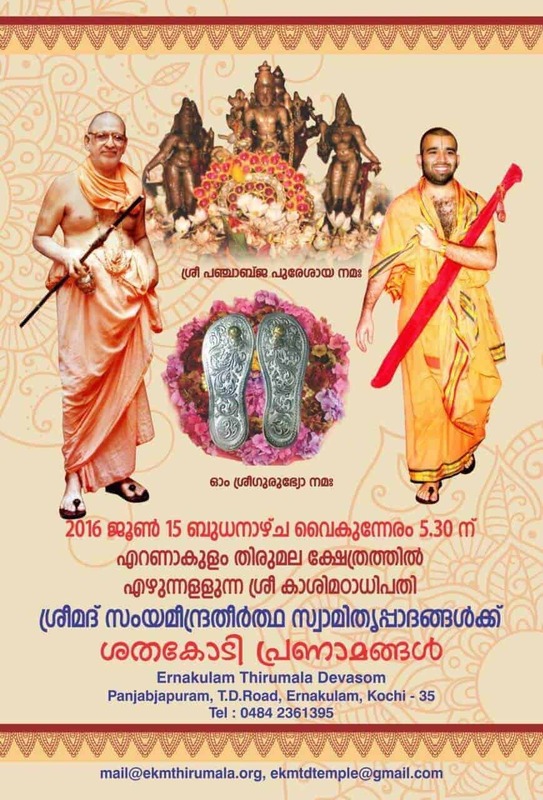 It can be recalled that Shrimath Sudhindra Thirtha Swamiji, had last visited the Tirumala Devaswom, back in 1997. It was the desire of the GSB community here to H.H Shri Swamiji to visit the temple where he had spent a majority of his childhood days in the poorvashram. H.H Shri Swamiji had therefore bestowed the Temple authorities with their Padhukas, when they called upon the guru placing a ‘Vinanti Patra’ during Shri Swamiji’s 72nd Chaturmas at Haridwar.